Lisa D. Parker is an accomplished veteran officer with 30 years of dedicated service to Manchester Township. She took the Oath of Office for the position of Chief of Police on March 2, 2015. Chief Parker began her law enforcement career in Manchester Township on May 1, 1989, in the Patrol Division. She has worked in all of the Police Division’s major bureaus and units, and served under all five of Manchester Township’s previous Police Chiefs. Among her accomplishments, Chief Parker became a Detective in 1995 and while working in that capacity implemented a Victim Intervention Program (VIP) as part of her Master’s Thesis. This program helped to increase police officers’ knowledge of domestic violence, empower victims, and stop violence through strict law enforcement. The VIP Program became a model for the State of New Jersey, and Chief Parker was recognized with the 1998 Women of Influence award for her work in domestic violence. After testing for the next position, Chief Parker was promoted to the rank of Patrol Sergeant in 2002 where she served until she was assigned to lead the Investigations Bureau in 2003. In 2006, Chief Parker tested for the next position and was promoted to the rank of Patrol Lieutenant. 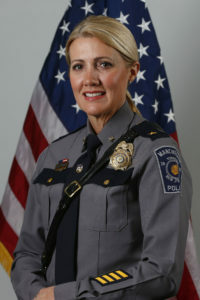 She was promoted to the position of Captain in 2011, overseeing all civilian and sworn personnel, and was assigned to manage the Office of Professional Standards. In this role, Chief Parker initiated the revision to the Field Training Program for newly hired officers and introduced a mentoring training program for newly promoted sergeants. Chief Parker also directed improvements to the hiring process and supervised changes to employee background investigations, ensuring only the best candidates are hired. Another focus for Chief Parker is combating the opiate epidemic impacting the State of New Jersey, specifically Ocean County. To increase enforcement efforts, she was instrumental in implementing the Narcotics Enforcement Team in 2015. Having found success with regard to enforcement, Chief Parker turned her attention to education and prevention when she selected several Officers to work with her to research, develop, and implement a new interactive high school opiate awareness program entitled #NEO which stands for Not Even Once. Instructed by police officers, this course is a collaborative effort between law enforcement and educators with the goal of informing students about the dangers of opiates before they leave for college or enter the work force. 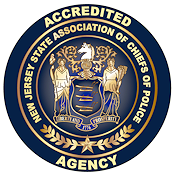 Chief Parker is proud to report that #NEO has grown exponentially throughout the State of New Jersey; by the beginning of 2019, more than 600 officers and educators have been trained by our Manchester Township Police #NEO Officers to teach the program in their jurisdictions. Some other newly implemented programs and accomplishments which have occurred under Chief Parkers command are: the addition of two K-9’s to the patrol division, Police Youth Academy, Youth Range Day, The Law Enforcement Elite Fitness Challenge, yearly School Safety and Security Assessments, Special Needs Identification program, the newly implemented and cutting edge 911eye program, the Ring Doorbell neighborhood crime prevention program, updated and increased standards for the Field Training Officers program for newly hired officers, incentives for officers to participate in the Captain Buscio Cardiopulmonary testing, and re- accreditation through the New Jersey State Chiefs of Police. Following in the Manchester Township Police tradition, Chief Parker is an advocate of higher education and has completed many prestigious Leadership programs. She holds a Master’s Degree in Public Administration from Central Michigan University and graduated from the West Point Leadership and Command program, where she now serves as an instructor. Chief Parker also completed the FBI-LEEDA trilogy (Executive, Command, and Supervision Leadership) courses along with the Fairleigh Dickinson University Executive Leadership course and will be attending the FBI National Academy training in April. The establishment and maintenance of efficient operation of the Police Division. The organization, control and maintenance of all property and resources within the Division. The development of the written organizational structure of the Division to include the chain of command as well as all duty assignments. The development and implementation of all directives necessary to govern the day-to-day operations of the Police Division. The maintenance of overall discipline within the Division. The maintenance of constructive relationships with the public, community organizations, the media and other law enforcement agencies.